If the U.S.-South Korea Alliance Goes, Does America’s Strategy in Asia Go With It? 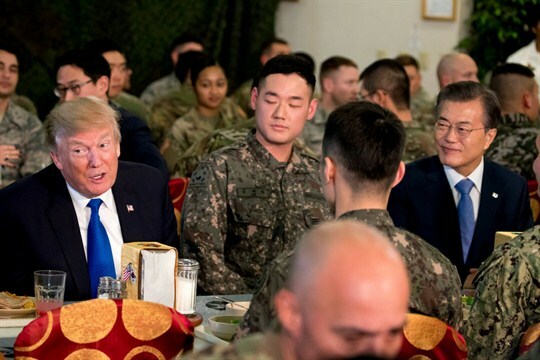 U.S. President Donald Trump and South Korean President Moon Jae-in have lunch with U.S. and South Korean troops at Camp Humphreys, Pyeongtaek, South Korea, Nov. 7, 2017 (AP photo by Andrew Harnik). It is a bedrock for both countries, so why does the 65-year-old security alliance between South Korea and the United States look shakier today than it has been at any time since its inception? Codified in a 1953 treaty after the armistice that froze the Korean War, the alliance helped South Korea preserve its independence and transform itself from one of the world’s most underdeveloped nations to an economic powerhouse and robust democracy, while signaling America’s determination to contain communism.